Planning permission: If you are going to buy an eco-home or eco-lodge kit or self-build, have you found land to erect it on and is there planning permission? In most cases, even if it is mobile, you may still require planning permission. New Technologies: Check out any new technologies or materials that are used within the package, not all have stood the test of time and some have resulted in leaks, creaks and no heat.. Trusted Developers: Even the big names have had faults with designs and components but at least you can claim compensation - is the developer you are purchasing from covered to ensure you are compensated if anything goes wrong? Features: Make sure you give a good description of the features present in the build. Does it have solar panels, underfloor heating, ground source heat pumps, rain water conversion systems etc? Awards: If you are an eco-home manufacturer or building company/architect/developer what awards have you won? List these to get more enquiries. 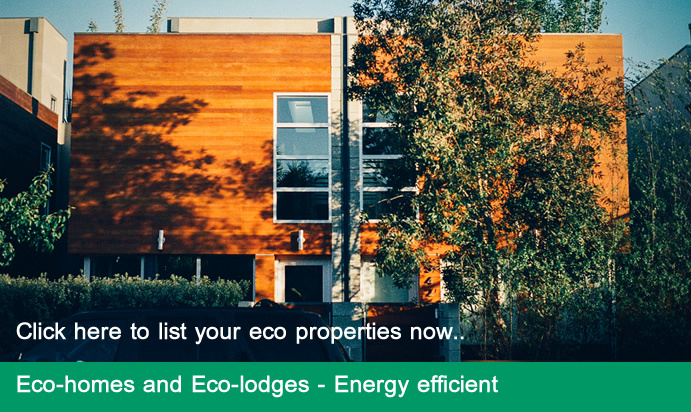 Cost Saving: Many eco-homes and eco-lodges can save a potential client lots of money in running costs when compared to conventional property - try and provide a comparison. Photos: Add as many photos as you can to provide as much insight into the eco-home or eco-lodge as possible. Include photos of erection process, interior, exterior and plans.